Mozilla Firefox 49.0 was released on September 20, 2016. The release of the browser was postponed by a week due to two bugs in the previous version that required more fixing time. Firefox 49.0 is the next major stable release of the web browser. 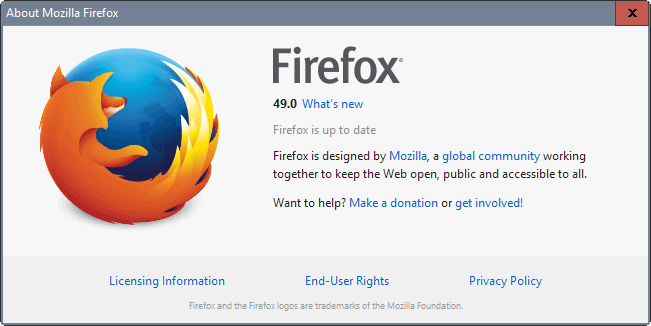 Firefox 48.0.2 and earlier versions of Firefox can be updated to the new release. Mozilla pushed out updates for Firefox Beta, Firefox Developer, Firefox Nightly, and Firefox ESR as well today. These browsers were updated to versions 50.0, 51.0, 52.0 and 45.4 respectively. Note: if you are reading this article on September 20, 2016: Mozilla will release Firefox 49.0 today. It is already available on the FTP, but the roll out of the update may not have happened yet. Firefox Hello is no longer part of Mozilla Firefox. Mac OS X 10.6, 10.7 or 10.8 are no longer supported. They are still supported by Firefox ESR though. 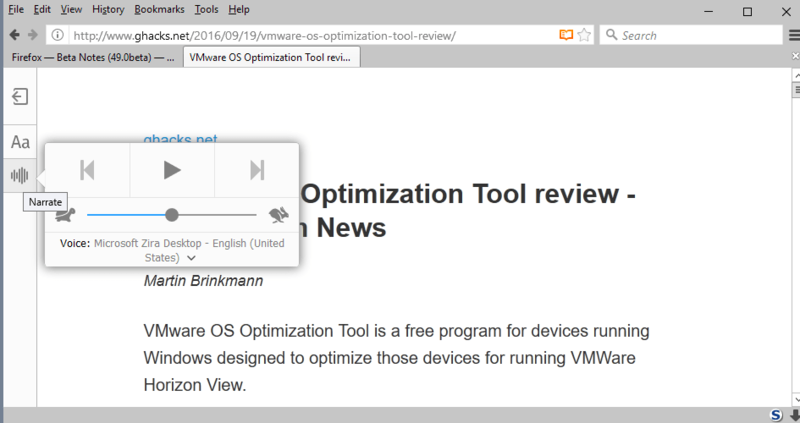 Firefox Reader Mode improved with text to speech option. Firefox multi-process is pushed to more users on stable. Firefox 49 will be distributed via the web browser’s update feature, and via the Mozilla website. Firefox users who have not touched the browser’s updating preferences should see an update notification soon in the browser. You may run a manual check for updates at any point in time to speed up the process. Tap on the Alt-key while Firefox is open, and select Help > About Firefox to do so. Firefox runs a check for updates, and displays any new version it found to you. Depending on the update settings, it may be downloaded and installed automatically, or you may be prompted to do so. You may download all editions of Firefox using the links below instead. Mozilla made the decision to remove Firefox Hello from Firefox. 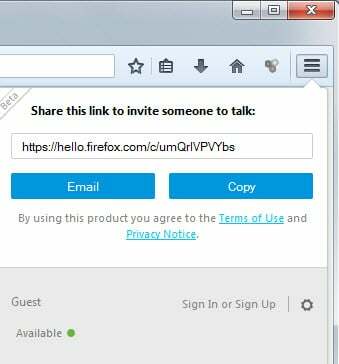 The organization launched Firefox Hello as a new communication tool that worked inside the browser and without plugin or third-party software requirements. Mozilla was criticized by part of the userbase for integrating Hello in Firefox, and decided one year later to change the focus from communication to tab-sharing. It removed the contacts feature from Hello which made it even less useful in the process. Hello was turned into a system add-on, the first for Firefox. 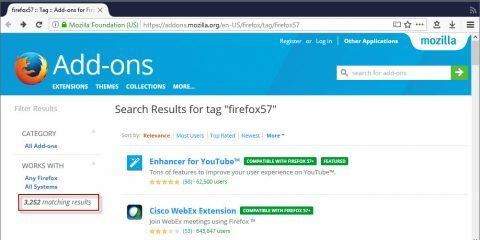 Mozilla announced the removal of Firefox Hello back in July, and Firefox 49 is the first stable version of the browser without the feature. 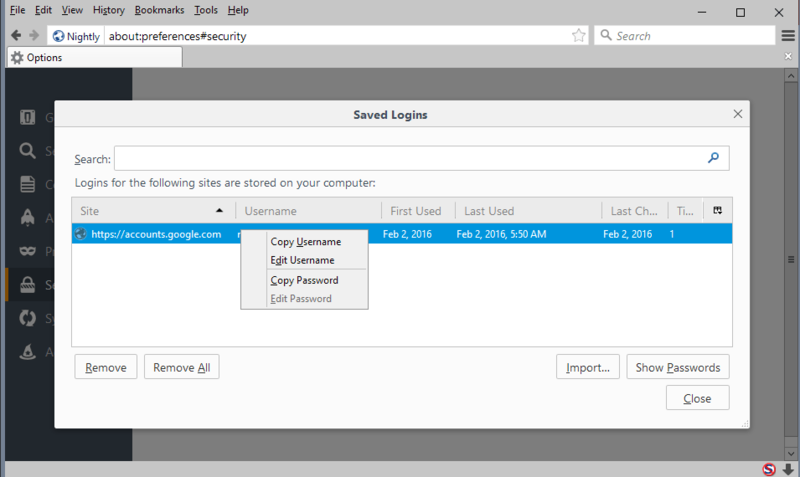 Firefox’s login manager used strict origin matching when it looked for a saved login for a website open in the browser. This meant that it would not match a saved HTTP login if the site was opened on a HTTPS connection, and vice versa. Starting with Firefox 49, Firefox improves the handling by allowing login information saved on the HTTP version of a page to become also available to the HTTPs version of a page. This is a one-way-street feature, as the other way around is not supported. You can read more about the HTTP login on HTTPS sites feature here. Reader Mode is an often overlooked feature in Firefox that turns any web article into an optimized version that trims the fat of the surrounding page. It is in this regard similar to readability extensions and services. What you end up with is the title, text and images of the article, but no other element of the site it was posted on. The improved Reader Mode in Firefox 49 ships with several new features. Most notable is the new narrate option which reads the text out loud, and new controls that allow you to adjust the width and line spacing of the text. Firefox 49 does not support Mac OS X 10.6, 10.7 or 10.8 anymore. Additionally, support ended on Windows for SSE processors. As part of Mozilla’s plan to deprecate NPAPI plugin support in Firefox, Mozilla plans to block non-essential Flash content on websites by default. You can check out the maintained blocklists on Github. Basically, Firefox 49 will block small (5×5 pixels or less) elements on sites if they meet certain other criteria such as calling enumerateFonts or ExternalInterface. 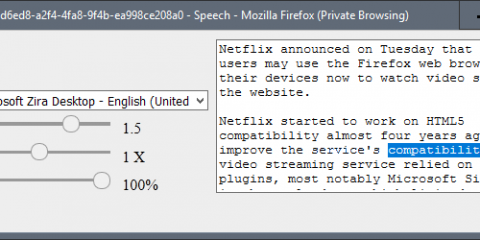 Firefox 49 on Linux will support plug-in free playback on Netflix and Amazon video. This is done through the integration of Google Widevine CDM for Linux. This means that Linux users don’t need Adobe Flash or a Silverlight alternative for that anymore. Adobe announced the resurrection of Flash for Linux in unrelated news recently. Fixed an issue on Mac systems that preventing users from updating Firefox if they did not install the browser originally. Appearance of anti-aliased fonts improved on OS X. Set the default HTML5 video volume. Improved performance on Mac OS X systems that support hardware acceleration. Improved video performance on systems that support SSSE3 without hardware acceleration. HTML5 audio can now be looped using the built-in context menu. Context menu allows you to play audio and video at 1,25 times the speed. Firefox supports TLS 1.3 now (not enabled by default). Print Preview with Simplify Page option to save printer ink and paper. One of the new changes in Firefox 49 for developers is a new cause column of the network monitor. Cause lets you know, basically, which resource, e.g. a stylesheet caused the listed file to load. This can be useful in quickly finding out why a file was loaded, and where you might find the instruction in the code. 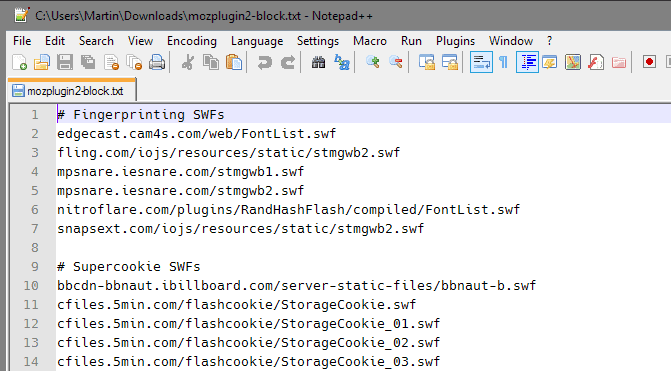 Users may find the information useful as well, especially if they analyze which files get loaded when they connect to a site. CSS autocomplete shows more suggestions. Various Developer Tools accessibility improvements, e.g. keyboard focus is more visible. The reload button is only enabled for temporary add-ons on about:debugging. The about:debugging page has a Tabs page added to it that provides you with options to debug any open tab in the browser. 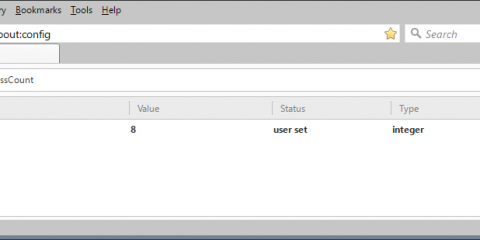 IndexDB databases can be deleted directly from the Storage inspector. Disable Cache has been renamed to disable HTTP cache. Several -webkit prefixed properties have been added for compatibility purposes. The first run page features Reader View and Sync as two new feature highlights. Tab appearance and behavior changes. 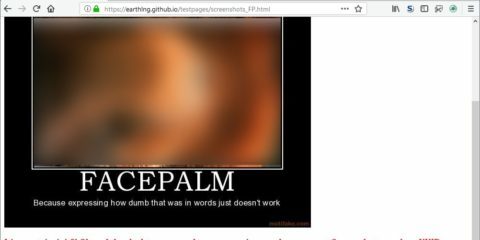 Scroll position and zoom level are remembered for open tabs for instance, and Firefox won’t play sound from multiple tabs at once anymore. Asynchronous notifications via Push API supported. Web Speech synthesis API supported. Security updates and fixes are announced after the release of Firefox 48. This guide will be updated when that happens. The post Firefox 49 Release: Find out what is new appeared first on gHacks Technology News.